Good Luck Hags: Overtime hero Carl Hagelin celebrates his series clinching goal that eliminated the Penguins in Game 5. He’ll now play for the Ducks after being dealt for Emerson Etem and the number 41 pick. After a quiet Day 1, the Rangers are very busy today in Day 2 of the Draft. They traded two players and also moved down to get more picks. The first move came when GM Glen Sather dealt Carl Hagelin, the 59th pick and 179th to the Ducks for Emerson Etem and their 41st overall. 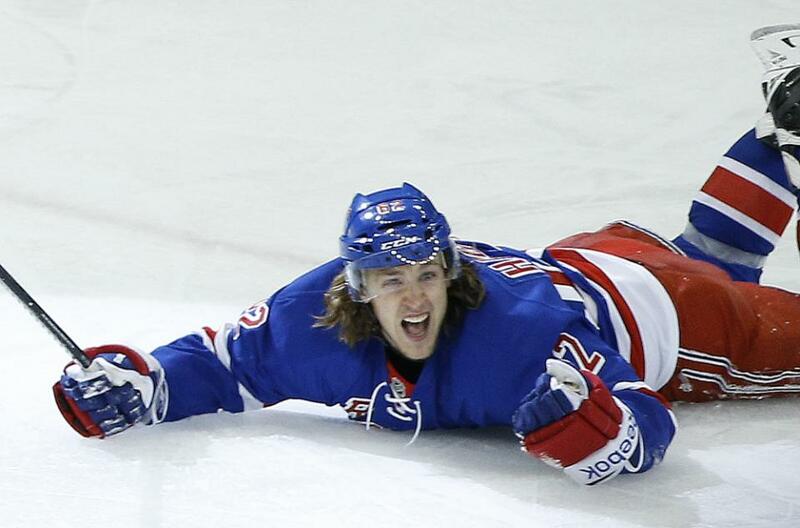 In dealing away the speedy 26-year old Hagelin, the Rangers saved money. Hagelin was going to cost too much. Especially with limited room to significantly bump up Derek Stepan while re-signing Jesper Fast and J.T. Miller. Plus they’ll need to sign a backup goalie and seventh defenseman. Hagelin probably would’ve cost $3.5 million. As good as he was in a checking role killing penalties, the popular Swede plateaued. He was never gonna be better than the 17 goals and 35 points he put up. We’ll always have that memorable overtime winner in Game 5 of the first round against the Pens. Unfortunately, his scoring dried up finishing with two goals and three assists in the postseason. Like many Blueshirts, I’ll miss Hags. He plays with so much heart never taking a shift off. His speed was an asset. He got breakaways and drove possession. His penalty killing was superb. I’ll be rooting for him in Anaheim. Thanks for a great four years. In acquiring the 23-year old Etem, the Rangers are banking on his upside. A former Ducks 2010 first round pick who was a big scorer in the WHL, he still hasn’t established himself as a consistent player. He’s played parts of three seasons with Anaheim totaling 15 goals and 16 assists for 31 points in 112 games. After a stint with Norfolk in which he tallied 13 goals and 21 points, Etem went 5-5-10 in 45 games. However, he did match his 2013 playoff total with three goals in 12 games this Spring. He has size going 6-1, 206 pounds. From what I’ve seen, he’s a good forechecker who takes the body. While he still hasn’t carved a niche, maybe the scenery change will work. Etem is a top nine forward but must gain Alain Vigneault’s trust. At 23, time is ticking. He’s restricted but comes much cheaper after earning $810,000 in the final year of his rookie contract. With the 41st pick, the Rangers selected Canadian left wing Ryan Gropp. Listed at 6-2, 187 pounds, Gropp scored 30 goals with 28 assists for 58 points with 44 penalty minutes in his second year with the Seattle Thunderbirds of the Western Hockey League. In six postseason games, he added a goal and seven helpers. I’ll have more later on him and other picks. After failing to get a first round pick for Cam Talbot, Sather dealt him to the Oilers with number 209 for picks 57, 79 and 184. He then moved the 57th pick to the Capitals for number 62 and 113. The Rangers took potential Hagelin replacement Robin Kovacs. Another Swede, Kovacs played for AIK in Sweden’s second division pacing them with 17 goals, 28 points and 63 penalty minutes. His favorite player is Steven Stamkos and compares his style to former Blueshirt Marian Gaborik. Talbot will finally get the chance to become a number one goalie. But he’ll have to do it for rebuilding Edmonton who landed future superstar Connor McDavid with the number one overall pick and took a chance on former Islander Griffin Reinhart to upgrade their blueline. It’ll be trial by fire for the popular former Rangers backup who guided them to the President’s Trophy. He’ll turn 28 next month and is signed for 2014-15 making $1.45 million. Of course, the Oilers will have to extend him next January. Hope Cam becomes a star. He’ll be counted on with Ben Scrivens who also is signed for one year and is 28. This entry was posted in Battle News, NHL Draft, NYRangers and tagged Cam Talbot, Carl Hagelin, Ducks, Emerson Etem, Oilers, Rangers. Bookmark the permalink.